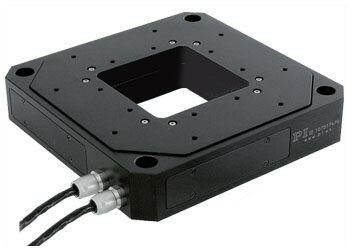 PI's 6-Axis precision nanopositioning systems come in classical flexure-guided / planar designs and in hexapod (stewart-platform) type construction. Planar Flexure designs provide travel ranges of typically up to 1000 µm with extremely good in-plane accuracy (straightness / flatness), hexapod designs on the other hand can be scaled to much larger travel ranges. 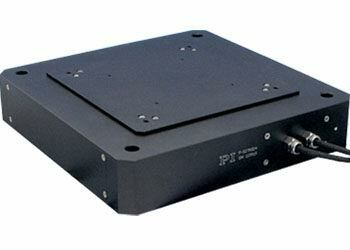 PI also provides non-magnetic multi-axis positioning systems. The 6-Axis PIMars piezo flexure stage is one of the most advanced nanopositioning systems in the world. Its parallel-kinematic design, where all piezo flexure drives act on the same moving platform, and sophisticated digital control algorithms (see E-712 digital piezo controller) make it possible to achieve highly precise coordinated motion in all degrees of freedom, with straightness & flatness in the low nanometer range. Custom systems with larger travel ranges or faster response are available on request. The P-587.6CD is a unique, highly accurate, 6-axis scanning and positioning system based on piezo flexure drives. It provides a linear travel range of 800 x 800 x 200 ?m and rotation ranges of several mrad. 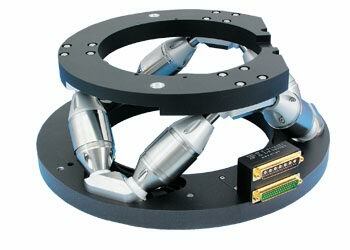 This non-magnetic 6-axis positioner combines the advantages of the parallel-kinematic hexapod approach with the precision and stiffness of the NEXLINE® piezowalk linear motors. It can handle large loads and automatically locks the position when powered off. The piezo drives do not exhibit magnetic fields and at the same time are not affected by magnetic or electric fields.